The "official" BRM web site of Rubery Owen Holdings Ltd. The BRM Association was formed in 2012 by BRM enthusiasts Eric Biggadike, John Burt and Anthony Delaine-Smith with the support and co-operation of David Owen OBE, Rubery Owen Holdings Ltd and Rick Hall of Hall & Hall. The aim of the BRM Association is to promote the history and legacy of BRM and provide a forum for BRM car owners, former employees and enthusiasts. Bourne Motor Racing Enthusiasts Club - who still meet in the heart of BRM country. Bourne Classic Car & Bike Show - for 2009 - "Following the success of the last three Classic Car shows in Bourne, the committee of Bourne Motor Racing Club have commenced preparations for this year's show. The event will take place on The Well Head Field in Bourne on Sunday, June 14. ...... A major celebration is being planned in Bourne, Lincolnshire, home of the former B.R.M. Formula One Grand Prix team, to commemorate the 50th anniversary of their inaugural world championship victory. This year also sees the 60th anniversary of B.R.M unveiling their first Grand Prix car and the 75th year of the E.R.A marque." Hall & Hall (previously Hall & Fowler) - experts in BRM restoration. Kings Lynn & District Motor Club "The origins of the club date back to the days of Raymond Mays and the then BRM Racing Equipe. It was during one of Raymond's talks to a local organisation to raise funds for the team that sparked off the idea of a BRM Supporters Club. This club was duly formed in the early 50's and, primarily held fund raising events for the team. KL&DMC was formed in April 1953 as an off shoot of the BRM supporters club and has been going strong ever since then." Ian MacFarlane works on "restoring and recreating classic racers" including BRM. Having earlier worked for the Team Surtees racing team Ian has spent a large part of his career rebuilding and recreating classic and racing cars with the Crosthwaite and Gardiner organisation. Photographs of some of his work on a BRM 2.5litre engine can be seen on his web site at http://www.ianmacfarlane.co.uk/brm.htm. The OWEN MOTORING CLUB website - is keeping the name of BRM alive via their club and their web site. Originally the "Owen Organisation Motoring Club". Pilbeam Racing Designs are still making racing cars in Bourne. Mike Pilbeam worked for BRM from 1963 originally as a stress engineer then moving on to work on the 1.5 litre four wheel drive project. He was involved in its success in the RAC British Hillclimb Championship before leaving the team. Mike rejoined BRM in 1973 and went on to design the P201 before setting up Pilbeam Racing Designs in 1974. Rover 200 BRM - Want to drive your own BRM ? - try the unofficial site for the Rover 200 BRM road car at http://www.thebrm.co.uk/vb/index.php. An award-winning book having been described as the most detailed and authoritative history of a grand prix team ever published, this first volume of a planned four-volume set covers BRMs tortured birth, the complexities of the troublesome V16 cars and their replacement with the 4-cylinder 2.5-litre cars of the 1950s. The teams creator Raymond Mays, its great benefactor Alfred Owen and BRM drivers of the calibre of Moss, Fangio, Brooks and Gonzales figure prominently in this remarkable saga, for which the authors have had access to and permission to reproduce documents from the companys private archive. This third volume continues the BRM saga through the racing life of the monocoque Formula One and Tasman single-seaters and sportscars of the mid-Sixties, offering the same dedication to detail, accuracy and behind-the-scenes revelations which have earned the two previous volumes such high praise by reviewers and book collectors. "The BRM Story - Vol 1 The V16 Years" published in 2000 by Duke Video. In Part I of this unique commemorative four part video series, motorsport historian Neville Hay reveals BRMs early history, induding the concept and development of the V16 and its subsequent acquisition of BRM by Rubery Owen. Raymond Mays and Peter Berthon dreamed of building a British Grand Prix car that could beat the best that Italy and Germany had to offer. Influenced by government sponsorship provided to other racing manufacturers, Mays enlisted the help of leading figures in the British manufacturing industry, and in 1947 the British Motor Racing Research Trust was born. From conception, developing the complicated car was an intricate and expensive affair. The car boasted no less than 16 cylinders in "V" configuration with an engine capacity within the then 1.5 litre limit. Its debut at Silverstone in 1950 was not a success and indeed its first two years of competition were notable only in their lack of accomplishment. However racing fans the world over thrilled to the sound of these magnificent cars, despite their lack of command on the track and today the sound of a BRM V16 on full song is still something special. "The BRM Story - Vol 2 The P25 Promise" published in 2000 by Duke Video. A much more favourable scene was set for the creation of the Type 25 2.5 litre 4-cylinder BRM which is explored in full in Volume Two of The BRM Story on video. Here you can witness the P25 as it made its debut with Peter Collins in late 1955. It proved to be mighty quick, if fragile, throughout 1956 and gave the BRM faithful a glimpse of what was to come. This promise was fulfilled with its first victory in the non-championship Caen Grand Prix in 1957 with Jean Behra. Motoring historian Neville Hay recaptures this promising period in BRM's history and finally, to Alfred Owen's immense joy, their first win in a World Championship event in 1959 with Jo Bonnier. 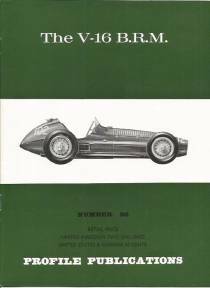 "The BRM Story - Vol 3 V8 For Victory" published in 2000 by Duke Video. n the third volume of this unique, commemorative, four-part video series, motorsport historian Neville Hay recalls what became BRM's golden years in GP racing. By 1962 team manager and chief engineer Tony Rudd had been told: "Win two Grand Prix or the team folds". With that in mind, he persevered with the development of the rear-engined, 1.5 litre V8 P57 that enabled Graham Hill to not only win four championship races (and the Worid Drivers' title) but also secure BRM's first Constructors' title. The team had won its reprieve but, more importantly, the international accolades that were its ultimate goal. Volume Three also relives the early racing career of rising star Jackie Stewart and remembers the exploits of leading Sixties' drivers Richie Ginther and Dan Gurney. "The BRM Story - Vol 4 3Litre Finale" published in 2000 by Duke Video. In the fourth volume of this unique, commemorative, four-part video series, motorsport historian Neville Hay recalls the final days of BRM and their GP victories, the story behind the complicated H16 and the departure of Graham Hill and Tony Rudd. Jackie Stewart, Richard Attwood, Tim Parnell, John Surtees, Peter Gethin, Jean-Pierre Beltoise, Jackie Oliver and Tony Rudd describe BRM's finale and how the company struggled to cope with the changing face of GP racing. David Owen, eldest son of Sir Alfred Owen and the Chairman of Rubery Owen Holdings together with Louis Stanley (brother-in-law of Alfred Owen) provide a fascinating insight into the running of the team and the enormous involvement of the Owen family. MotorSport has over the last few years provided some of the most interesting and detailed stories of motor racing covering the whole history of the sport. During the BRM years the magazine's racing reports were second to none for insight and independence. Denis Jenkinson as their "Continental Correspondent" was considered to be the best race reporter of the era. The story of BRM by its founder, from the early days of struggle up to the glory of the World Championship win. A detailed tale of the development of high performance machinery, but always with the tang of high emotion from one devoting his life to a cause. "Following their pioneering work on Whittles engine (Vikings at Waterloo) Rover built on the experience with a number of projects to develop small, cost efficient gas turbines, in particular for road use. Team member Mark Barnard recounts some of the trials, tribulations and successes encountered in the thirty years following the war." 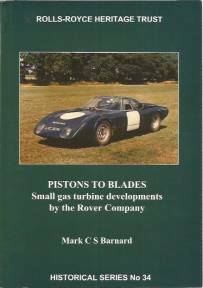 Covers the BRM Le Mans car and other projects involving the Owen Organisation and BRM. In more than 50 years as an engineer in the field of high performance engine development and Grand Prix racing, Tony Rudd became a world-renowned authority, highly respected for his innovative methods. He was intimately involved with the extensive changes brought about in high-performance engine and car design, from his years with the BRM team where he became Chief Engineer and Team Manager, and thereafter as Group Engineering Director at Lotus. The story he tells, re-issued to meet continuing demand, is both an exciting read and a reliable eyewitness account, which sets straight the historical record. From his pre-war school holiday involvement with Prince Chula and B. Bira and their ERAs, Tony Rudd went on to become an engineering apprentice at Rolls-Royce in Derby and thereafter Hucknall. After a wartime spent mostly working round the clock on aero-engine service and durability problems, he was seconded to Raymond Mays troubled BRM workshops in Bourne, Lincolnshire. There he caught the motor racing bug for good-and never returned to Rolls-Royce. At BRM Tony Rudd had a do-or-die ultimatum from Sir Alfred Owen. The crunch year was 1962. Under Rudd's leadership BRM redeemed itself by winning the Constructors' Championship, and giving Graham Hill his first Fl World Championship. Seven years later Tony Rudd joined Cohn Chapman at Lotus where he worked for more than 20 years until his retirement in March 1991. By Richard Nisley ..."The Ragged Edge is the story of a man who is running -- after the Grand Prix world championship he seems destined not to win, and after the woman who has left him. It's a heart-stopping ride across three continents, on famed international circuits as glittering and intoxicating as Monaco and as beguiling and lethal as Germany's 'green hell' Nurburg Ring." Those of you who remember the days of Eagle-Weslake, Brabham-Repco, Cooper-Maserati and the BRM H16 may enjoy the challenge of picking out some of the dramatic events in this work of fiction that hint at factual incidents from an era where anything could happen and usually did ! V2.2 - 5 December 2015 ---- recommended resolution (1366 x 768).